Dr. Albert has performed over 10,000 cataract procedures and is an active member of several scholarly and professional associations. Through his writing, speaking, and committee work, he has made important contributions to vision research, treatment, and medical care internationally. Dr. Albert’s accomplishments and professional affiliations include: • Medical Degree and Post-Doctoral Fellowship in Ophthalmic Pathology, McGill University. • Fellowship in Vision Rehabilitation, McGill University and Lighthouse International, a world renowned vision rehabilitation institute in New York, NY. • Chief of the Ophthalmology Service at Anna Laberge Hospital on Montreal’s South Shore. • Assistant Professor of Ophthalmology, McGill University, Montreal. • Has helped establish training programs to improve vision care in South America, India, Europe, Canada, and the United States. ( Dr. Darren Albert, Ophthalmologist, Montreal, QC ) is in good standing with the College of Physicians and Surgeons. The speaker in the video may have no association with ( Dr. Darren Albert, Ophthalmologist, Montreal, QC ). 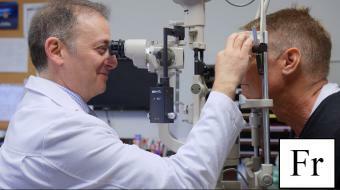 ( Dr. Darren Albert, Ophthalmologist ), may talk about some of the conditions and some of the treatment options shown in the videos on HealthChoicesFirst. Always talk with your health care practitioner about the information you learnt from the videos in regards to treatments and procedures the healthcare practitioner could perform and if they would be appropriate for you. Remember good information is the corner stone to understanding your condition or disease. Please contact ( Dr. Darren Albert, Ophthalmologist, Montreal, QC ) to enquire if this health care provider is accepting new patients. I found Dr. Albert to be a very informative and helpful in comparison to some other ophthalmologists I visited in the Montreal area. An ophthalmologist is a physician who specializes in the medical and surgical care of the eyes and visual system. 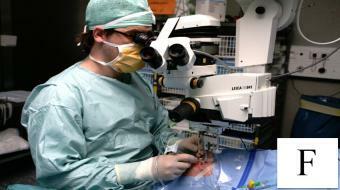 Ophthalmologists work with patients in the prevention of eye disease and injury. In treating patients an ophthalmologist may also educate them on eye care, glasses and contact lenses, glaucoma, oculoplastics, refractive surgery, pediatric ophthalmology, neuro-ophthalmology, laser eye surgery, canaloplasty, cataract surgery, corneal transplant surgery and vitreo-retinal surgery. A cataract is a clouding of the lens of the eye. Cataracts usually develop slowly, causing a painless and gradual decrease in vision as the lens of the eye prevents light rays from properly passing through. Cataracts can affect both eyes or just one, and some patients experience mild symptoms, while others can barely see any shapes or movements. Glaucoma is an eye disease caused by a buildup of intraocular pressure (IOP). Your eyes have clear liquid that flows in and out, but if you have glaucoma, this liquid doesn’t drain properly, causing this buildup of IOP pressure. Glaucoma is a disease of the optic nerve, which is made up of nerve fibers and transmits images from the eye to your brain. 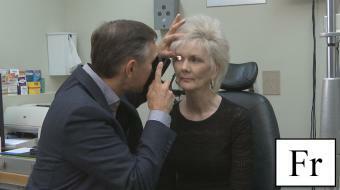 Age-Related Macular Degeneration? " Betty a 75-year-old female with sudden onset of central vision loss in her right eye "
Managing a Type 2 Diabetes Diagnosis " John 55 years old recently diagnosed with Type 2 Diabetes "
Eye Health and Night Vision Problems - " Stephanie is a 35-year-old figure skating coach"